SuperCook is to the rescue, helping you waste less food and eat fantastic meals. This website is simple and effective, and there’s no need to download or install anything on your phone. Start by selecting ingredients you already have on hand from several categories (such as meat, seasoning and dairy). As you add available ingredients, SuperCook suggests recipes, updating results for each new item you include. From there, you can narrow down your results by selecting the type of meal you want to make (such as soups, salads, casseroles, you name it), type of cuisine and the star ingredient. Once you get into the habit of using SuperCook, you’ll probably find yourself doing the same things again and again. If you want to save your ingredients and favorite recipes, you can make a profile. Allrecipes is available on multiple devices, including tablet and smartphone. You can find recipes by browsing through categories such as dietary restrictions, ingredients, cuisine type, meal type, season and cooking technique. Searching by ingredient allows you to set your parameters based on what you have available. The easiest search is with the “dinner spinner,” a tool that lets you quickly spin through a combination of options by dish type, ingredients on-hand, and how long before the meal is ready. 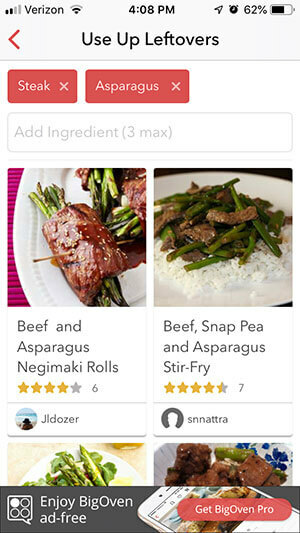 In fact, the app lets you list ingredients to include or omit in recipe results. That way, if you don’t have chicken in the fridge, the app won’t show any recipes that contain chicken, even if you have all of the other necessary ingredients for a certain dish. Save your recipes and ingredients by creating an account – you can log in anywhere, including on your phone, tablet or computer. With more than 500,000 recipes in its database, BigOven is certainly, well, big. This app lets you navigate and brainstorm in a number of ways. For instance, check out the Ideas section to browse through meal inspiration. There you’ll find categories like “Use Up Leftovers,” which curates recipes based on reusing ingredients. The Collections area includes recipe ideas for healthy breakfasts, healthy snacks, meat-free, soups, low-carb, and more. Most recipes come with nutritional facts that include the number of calories per serving. The Grocery List section allows you to sort by ingredient and keep tabs on what you’ll need to make a certain meal. Quickly add items to your list for easy shopping the next time you’re out. The Planner lets you come up with dishes for the future so you’re not stuck trying to compose a meal with random ingredients again. Epicurious is an app that’s both beautiful to look at and easy to use. You can toggle through ingredients to find recipe ideas, many of which feature photos of the finished dish and instructional videos to help you along the way. Quickly browse recipes by adding filters such as “leftovers,” “dinner,” and any dietary restrictions such as “gluten free,” “dairy free,” “keto friendly” and so on. Next, add the main ingredient you wish to search for in the search area, and then sort your list by the highest rated recipes, the percentage of users who would make it again, and other criteria. The app also includes a kitchen timer to help you cook ingredients to perfection even without a recipe, and a tool that finds local, seasonal ingredients. Cookpad is part recipe finder, part social platform. You can search for recipes by ingredients and share what you’re making. Invented a fantastic recipe you want to share? Post it publicly along with an image so other users can test it out. List the ingredients, snap an image, and write your story. If people like what you’re posting, they can follow you. Of course, you can also follow people who make recipes that match your preferences, and even ask them questions. To start a conversation, go to the chat area and turn on notifications so you know when others reply. You can also search conversations to see what others are talking about, and join in. And people are talking on Cookpad from around the world! Founded more than 20 years ago in Japan, the app has more than 100 million users in 23 countries. In addition to English, Cookpad is available in Spanish, French, Italian, and 20 other languages. Other search terms you can use include dietary restrictions, recipe names and holidays. Basically, any category you can think of. Tasty became popular for its overhead food videos with instructions for each step as you prepare a dish. But it’s also a handy tool to search for recipes you can make with whatever you already have on hand. Search by ingredients, then add filters such as “dinner,” “brunch,” and any dietary restrictions. You can also search by occasion, whether it’s date night, weeknight, or game day. Once you make your selection, the recipe video plays, displaying ingredient measures and other instructions right on the screen, in sync with the video. For efficiency, the videos play at a faster speed, but you can pause and unpause the videos as you go. Some of Tasty’s most-watched videos are reportedly those featuring cheese, steak, bacon and pasta—perhaps ingredients you have on hand now? America’s Test Kitchen (ATK) is America’s most-beloved home cook television program, featuring episodes such as, “The Perfect Cookie,” “Just Add Apples,” and “All Chocolate, All The Time.” So it’s no surprise that the ATK app is quickly becoming the digital tool of choice for serious home cooks. The catch? It’s only available to members of ATK’s online cooking school. Still, for the serious home cook, it’s a great option, with full courses featuring special instruction from ATK and Escoffier chefs. So be sure to use this app only when you have time to learn and refine your technique. Search by main ingredient, such as pasta or vegetables, level of difficulty, and recipe type. Keep track of the courses you’ve completed, and take advantage of your exclusive access to world-class chefs and instructors.